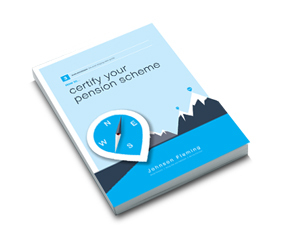 As more and more employers face renewal of their pension scheme certification, Johnson Fleming has launched a jargon-busting guide, intended to support employers through this complex but crucially important part of the auto-enrolment process. Time is running out for a growing number of employers, who face sanctions from The Pensions Regulator (TPR) if they do not get to grips with complicated auto-enrolment certification regulations. Towards the end of 2014, 1,139 compliance notices were issued by TPR; this has affected employers that have worked hard to reach regulations, but fell short as a result of unnecessary confusion. Aimed at HR professionals, the guide, entitled ‘How to… certify your pension scheme’, cuts through the minefield of information surrounding certification, covering issues including: who needs to do it; when to renew your certificate; what happens if your certificate falls short; and what renewing your certificate means for your business. Between now and 2017, the largest tranche of UK businesses, approximately 598,000, will reach their auto-enrolment staging dates. As more and more employers stage, the number of firms entering the second phase of auto-enrolment and needing to renew their certificate will also increase. Johnson Fleming’s consultancy director, Iain Chadwick, said: “Certifying your workplace pension scheme is undoubtedly one of the hardest areas to get right. “Even establishing whether or not a pension scheme actually needs to be certified can prove difficult, but in a nutshell, if your definition of pensionable salary is different to that of qualifying earnings, you must certify unless you have chosen to perform an entitlement check. Also, if anything in your organisation that could affect your scheme has changed, certification is a must. “It is an employer’s obligation to ensure that its pension scheme meets the required standards, and action by TPR will follow for any company that falls short. This is already happening, as the leap in compliance notices shows, but we believe that this is not down to a lack of effort by employers; more a gap in understanding and a lack of available advice. ‘How to… certify your pension scheme’ is the most recent of a series of guides on protection, health and wellbeing and re-enrolment to provide a useful tool for HR, payroll and pensions professionals. For more information, or to download the free guide, visit www.johnsonfleming.com or call 01527 571 300.